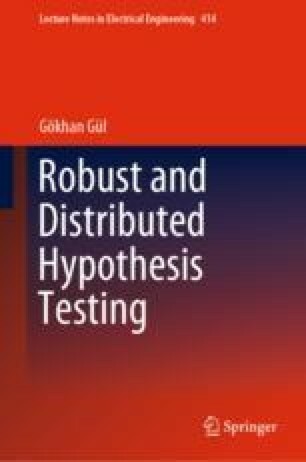 Design of a robust hypothesis test requires the simple hypotheses to be extended to the composite hypotheses via a suitable choice of uncertainty classes. The reader is referred to Sect. 2.2.2 for the fundamentals of robust hypothesis testing. In this chapter, minimax robust hypothesis testing is considered, where the uncertainty classes are built based on a single distance. From a single distance it is understood that the considered neighborhood classes accept only a single distance or a model. The original version of this chapter was revised. An erratum to this chapter can be found at DOI 10.1007/978-3-319-49286-5_9.